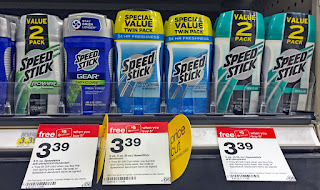 The Target Saver: Lady & Men's Speed Stick Deodorant - As low as $0.56 ea.1! Lady & Men's Speed Stick Deodorant - As low as $0.56 ea.1! There is a new gift card promotion on Speed Stick and Irish Spring products at Target: buy five and receive a $5.00 gift card. Stack manufacturer coupons with Cartwheel and pay $1.12 per twin-pack of deodorant!